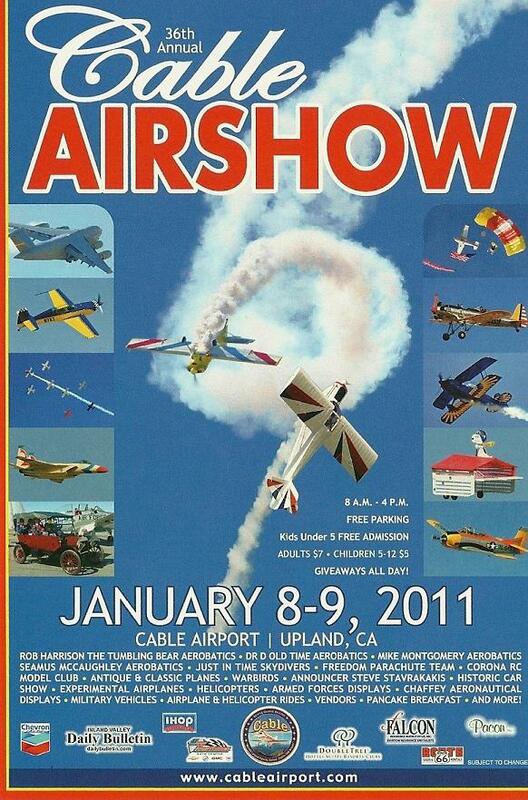 Montebello Mom: Upland Air Show: January 8 & 9: Family Fun! Thanks to Debra from Whittier for finding this gem! Adults $7, Kids 5-12 years $5, Children under 5 are free! Hands on opportunities for the kids! 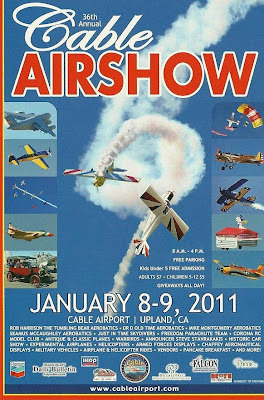 The Upland Cable Airport puts on a wonderful Air Show, January 8 and 9, 2011...We went last year and it was very good. They have men and women jumping out in parachutes, all kinds of planes, planes doing tricks, they have young girls and boys that have taken lessons who fly...if you don't go into the Airport there is plenty of space across the street where people bring chairs and also watch. The air show website also lists the price of "ride opportunities" where you can pay to fly to be a passenger in some private planes including a bi-plane and a helicopter! It looks great! Thanks again Debra! To see the official air show flyer click here! the flyer says adults are $7. Thanks for the info on the Air Show. My husband and I took the kids out for a few hours to watch the planes. We arrived around 1 and chose to skip what would have been a $31 entrance fee. Instead we grabbed lunch and parked our chairs on a grass hill that overlooked the runway. Pretty neat experience.